In a bowl, combine mince, drained shredded cabbage, minced garlic and ginger, chopped spring onion, soy sauce, cooking wine and sesame oil. Mix well, ready to add to dumpling wrappers. In a bowl, combine plain flour, xanthan gum and boiling water. Mix well, tip onto a lightly floured surface and knead quickly (the dough should be firm and not be too sticky). Shape into two rolls and wrap in cling film. Set aside at room temperature to cool and for dough to plump up. When cooled, cut each roll into even rounds (about 12-16). Roll into thin rounds, ready to fill and form a dumpling skin. Drop teaspoon sized amounts into the centre of each thin round, fold in half and pinch or crimp closed to desired shape. As you go, place all folded dumplings on a plate or in an airtight container ready to cook. Heat a pan with a little oil. Add dumplings to pan, one side down and pan fry until golden on one side. Add a few mm of water to the pan, place lid on and cook for a further 3-5mins until steamed through (do not turn). 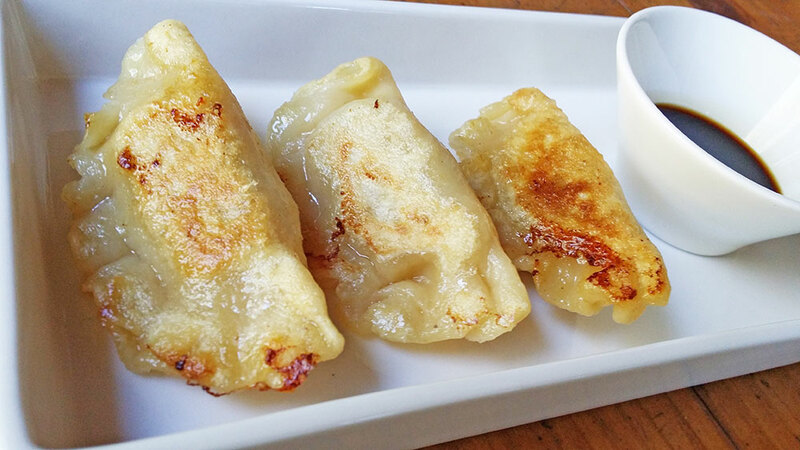 Pot sticker dumplings are fried golden on one side and silky and steamed on the other. These dumplings are amazing pan fried and equally delicious added to boiling hot soups or broths for a few minutes until cooked through. Tip: If I have any left over mince mixture, I roll into small meat balls and freeze in an airtight container ready for quickly adding to soups, broths, sauces or casseroles, for a super fast meal later down the track.